For the second time in three seasons, the Trojans finish with 10 wins. 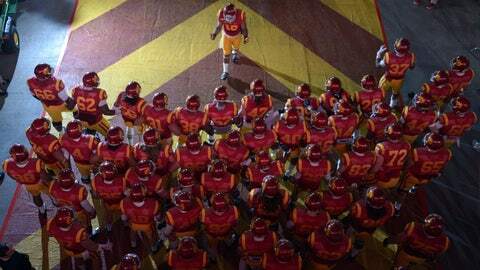 LAS VEGAS — USC came to Sin City locked and loaded with the Power of Ten. No Coach O, no problem. Sure, when the No. 25 Trojans entered Sam Boyd Stadium to take on No. 20 Fresno State in the Las Vegas Bowl, they were playing for their most recent former coach, Ed Orgeron. They were also playing for something much greater than that — their 10th win. The win came easier than expected. A lot easier. 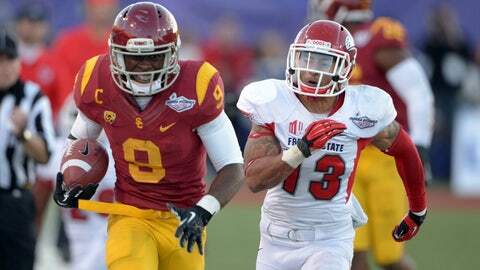 The Trojans stormed out to a 35-6 halftime lead and finished off Fresno State 45-20 to be crowned 2013 Royal Purple Las Vegas Bowl champs, behind bowl MVP Cody Kessler’s career-high 344 yards and a Las Vegas Bowl-record four touchdowns. Las Vegas is a lot farther than El Paso in more ways than one, but still there were questions for USC (10-4) entering Saturday afternoon’s bowl game against the Bulldogs (11-2). Could they continue to fight on now playing for their "third string" head coach? Would they even be motivated playing in a lower-tier bowl? How were they going to replace the emotional boost given to them by Orgeron over the last eight weeks of the season? "We talked about what kind of men we were going to be in the face of adversity," interim head coach Clay Helton said. "Were we going to use it as an excuse to be on your third string head coach? Were we just going to let up? Or were we going to say weâre not going to fail today?" USC opted for the latter. The Trojans answered all questions and passed all tests with flying colors. They won because 10 was just way more important than any of the aforementioned questions. Ten put them in a club that only the minority of programs across the country could be a part of. "We just deserve to win," Josh Shaw said. "We’ve been through a lot as a program so having the opportunity to get 10 wins in college football is hard to come by and we had that opportunity in front of us and we wasn’t going to let it get by us." Despite rumors swirling that Helton is going to be the next offensive coordinator at Florida in addition to reports that he would be retained by Steve Sarkisian and USC, he didn’t take his job as USC’s interim lightly. Using one of the team’s slogans "All Hands on Deck," Helton was locked in. "As a coach you focus on one thing — that’s your job," Helton said. "If you’re going to beat a Fresno State team you better spend every waking second preparing or they’re going to get after you and that’s all we’ve done as an entire coaching staff." Helton’s play calling had the offense humming from the start. The Trojans reached the end zone on five of eight first-half possessions. The last of those possessions was just one play – a kneel down by Kessler with one second remaining to end the half. Defensively, they held Fresno State to just 254 yards — down from the 572.4 yards per game they averaged on the season, which was third in the country. Derek Carr, the nation’s leading passer, was limited to just 217 yards on 29-of-54 passing for two touchdowns and an interception in the face of a heavy USC rush. USC conquered Las Vegas. Fourteen weeks and three head coaches later, the Trojans stood as bowl champs for the first time since 2009. They were ready. They were motivated. And they had the Power of Ten.